After getting an ice cream maker for my birthday this summer, I began experimenting with numerous flavour and texture combinations, accompanied by my trusty ice cream bible, The Perfect Scoop. Following in quick succession came a trip to Sicily with a group of girlfriends at the end of August, where I strolled the streets looking for the best gelato available, feeling like a kid in a candy store when presented with such choice and quality. One common sight in amongst the array of amazing artisan flavours (think seed-studded vanilla, creamy hazelnut, pure pistachio devoid of any nasty artificial colouring and more…) was a pile of fluffy white buns stacked alongside the ice cream cones and cups. It’s a Sicilian tradition to serve up scoops of soft, sweet ice cream in these giant brioche-like baps and the locals seem to love it, holding the open bread as you would a giant bowl and digging in with tiny plastic spades. Call me conservative but I couldn’t quite get my head around this way of serving ice cream. I’d rather leave more stomach space for the ice cream itself, and for me the heavy white roll had the effect of dampening my tastebuds rather than cleansing or lifting my palate. But it did get me thinking about ice cream sandwiches, and how I might be able to translate the idea into my own cooking back home. The idea of an ‘ice cream sandwich’ can conjure up so many different images. For many I imagine it’s the ubiquitous Maxibon found in freezers all over Europe; half block of synthetic-tasting choc ice, half slightly soggy biscuit, the sum being greater than its parts in the annoyingly addictive way of certain mass-produced foods. For us Brits it’s probably a slab of vanilla sandwiched between two crispy ice cream wafers, while the Americans do a little better with their chewy cookie version of this icy treat. And who could forget the elevation of this seemingly simple pleasure to boutique patisserie status when Pierre Hermé introduced his incredibly elegant Miss Gla Gla a few years back; artisanal ice cream sandwiched between layers of macaron and sablé. My sandwich isn’t quite as elegant, but the flavour certainly packs a punch. Rich, mellow white chocolate is paired with fiery ginger in the biscuit layer, the close-to-cloying sweetness of the ice cream offset by a slight peppery kick. White chocolate gets a pretty bad press, made as it is from everything but the cacao mass that gives good dark chocolate its identity. However, if you approach it as a completely different entity, white chocolate has a certain smooth sweetness that is hard to dislike, and works wonderfully with strong, bold flavours – spicy ginger, sharp cranberry or bitter orange. In the recipe below I’ve added an egg to the biscuit batter to create a softer, richer gingerbread man which withstands the freezing process. If you’re planning just to eat these on their own – and who can resist a batch of freshly baked gingerbread men in the run up to Christmas? – you might want to leave the egg out for a crisper, crumblier cookie. Preheat the oven to 175 degrees C. Line a baking tray with baking parchment. Beat together the butter, sugar and golden syrup until light and fluffy, then beat in the egg. Sift together the flours, bicarbonate of soda and spices. Stir into the butter mixture until fully incorporated then roll into a ball, wrap in cling film and chill in the fridge for 15 minutes. Roll out the gingerbread to about half a centimetre thick. Cut into desired shapes and bake for approx. 10 minutes, until the gingerbread is golden but still slightly soft. If you’re making shapes of wildly different sizes, make sure you place n different trays to allow for different cooking times. Remove from the oven and allow to cool slightly before transferring to a wire rack. Beat the butter in a mixer until smooth, light and fluffy. Add the vanilla extract then gradually beat in the sugar on a low speed. Turn the speed up to high, add the milk and beat until the whole mixture is light and fluffy. Add a little more milk if needed. If you want to colour your icing, divide into desired quantities and add a few drops of food colouring to each. 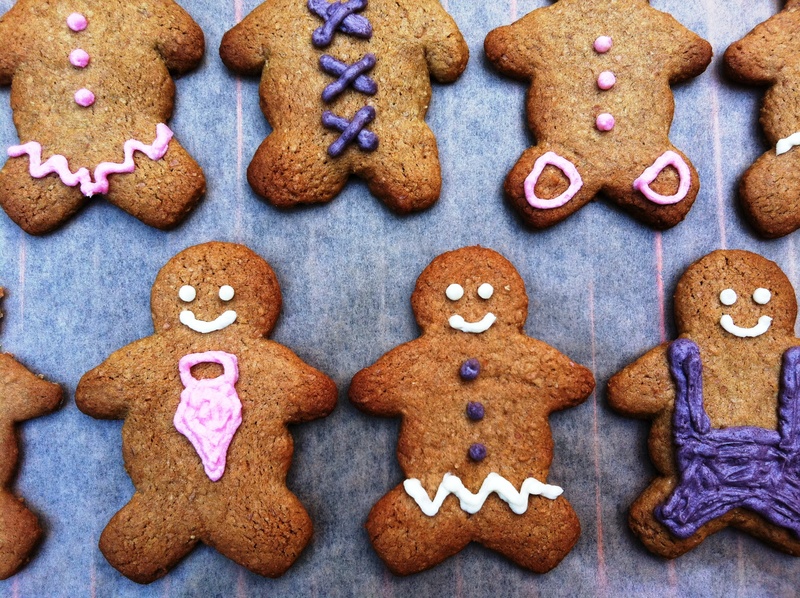 Pipe onto cooled gingerbread men in any patterns you want (my favourite is the one in dungarees!). Line a 23cm square tin with greaseproof paper. Put the chocolate in a large bowl with a sieve set on top. Warm the milk, sugar and salt in a saucepan. In a separate bowl, whisk together the egg yolks. Slowly pour the warm milk over the egg yolks, whisking continuously, then scrape everything back into your saucepan. Cook the custard over a medium heat, stirring constantly, until it thickens and coats the back of a spatula. Remove from the heat and pour through the sieve over the white chocolate. Stir until the white chocolate is completely melted, then stir in the cream. Stir until cool, ideally over an ice bath. Chill thoroughly in the fridge before churning in your ice cream maker. When ready, pour into your prepared tin and freeze hard. Once the ice cream is set hard, take your gingerbread man cutter (or whatever you’ve used to cut out the biscuits) and cut out the corresponding number of ice cream shapes to your biscuits. Remember you’ll need half as many ice cream shapes as biscuits! Work quickly to avoid the ice cream melting, and return to the freezer as soon as you’ve cut them out to set hard. Once completely firm, take your ice cream blocks from the freezer and sandwich between two gingerbread shapes. Wrap in cling film and return to the freezer until you’re ready to eat. Alternatively you could freeze the ice cream in a normal container and simply scoop a dollop onto the back of one cookie before sandwiching with the other and serving. Slightly less impressive perhaps but just as delicious and probably a lot less hassle. *the eagle-eyed amongst you will spot a few swirls of caramel running through my ice cream. I had some leftover salted caramel from another recipe so stirred it through the ice cream. It was absolutely delicious, but made the ice cream softer and harder to work with when creating the sandwich shapes, so unless you’re a caramel obsessive I’d suggest you stick with the recipe as is. I’m adding this post into the Ginger and Bonfire Tea Time Treats Blogger event hosted by the fabulous Karen of Lavender and Lovage and Kate of What Kate Baked. If you’re looking for more baking inspiration, don’t forget to check out the round-ups on each of their blogs from 1st December! White chocolate and ginger is one of my favourite flavour combinations and I love ice cream sandwiches so this recipe is right up my street! What a wonderful idea, and one which will please adults and children alike! Lorraine – I love the idea of ice cream sandwiches in ice cream cone biscuits. Might have to give those a try! Laura – I think they appeal to the kid in all of us, big or small! Miss South – I’d never eat a bar of white chocolate either, but then I never really eat chocolate bars. Much prefer baking with them! I love the idea of an ice cream sandwich – there is something delightfully childish but decadent about it. The gingerbread men look fabulous! oh oh oh! 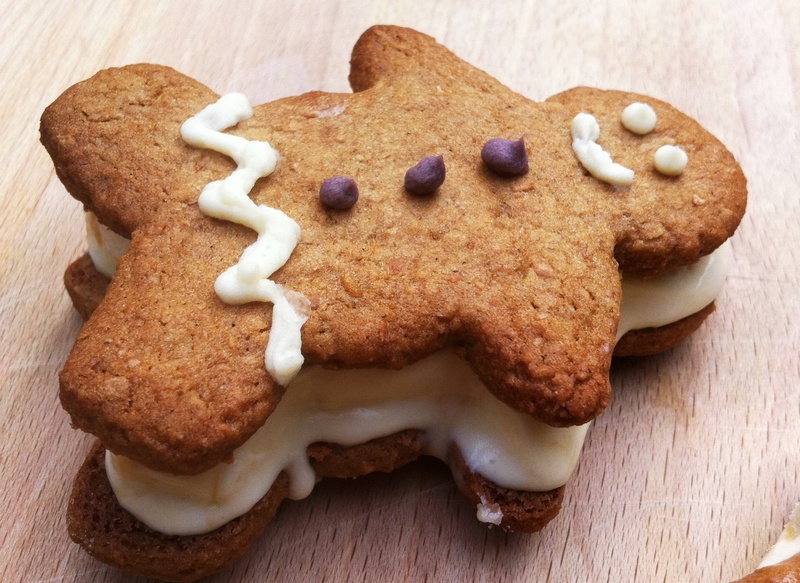 i think I’m in love with your gingerbread men sandwiches – inspired! These are so freaking cute!!!! In the US, for a while homemade ice cream sandwiches with big flat chewy chocolate chip cookies as the sandwich were wildly popular (I was OBSESSED) but mine were slapdash at best. I love what you’ve done here. And I think I will have to try your gingerbread recipe. Now see, this is something aimed right for Mr. Sweet Butters heart!! H would love love love these. Ginger cookies are a fav of his. As for me… I just love your style of writing (did I ever tell you that?…I should have.). I’m addicted to vocabulary and would memorize the dictionary if it was humanly possible. Ubiquitous is such a great word and I love the word “cloying or cloy”. They sound so smart and fun at the same time. I bet a game of Scrabble between us would be great fun! BEAUTIFUL and so cheeky looking too! Thanks for entering these wee gingerbread men into Tea Time Treats, they are indeed a TREAT to look at and eat! These are adorable, love the ice cream sandwich! These gingerbread men are adorable, now I only have to buy a cookie cutter in this shape. Gourmet Chick – ice cream sandwiches are awesome. Sometimes you need the clean, smooth taste of a single scoop of ice cream, but sometimes a full-blown chewy, sugary, cookie-shaped experience is simply necessary! Janice – so glad you like! Susan – ice cream sandwiches made with chocolate chip cookies are a classic. The cookies stay beautifully chewy in the freezer which is so important. Karen – thank you. Looking forward to seeing what other treats are entered! I think your post is hilarious. Can imagine eating the sandwich in one go in an attempt to stop the icecream from melting. 1,000 calories consumed in 10 seconds!! I do not like brioche con gelato. I however love a good ice cream sandwich, especially a homemade one. 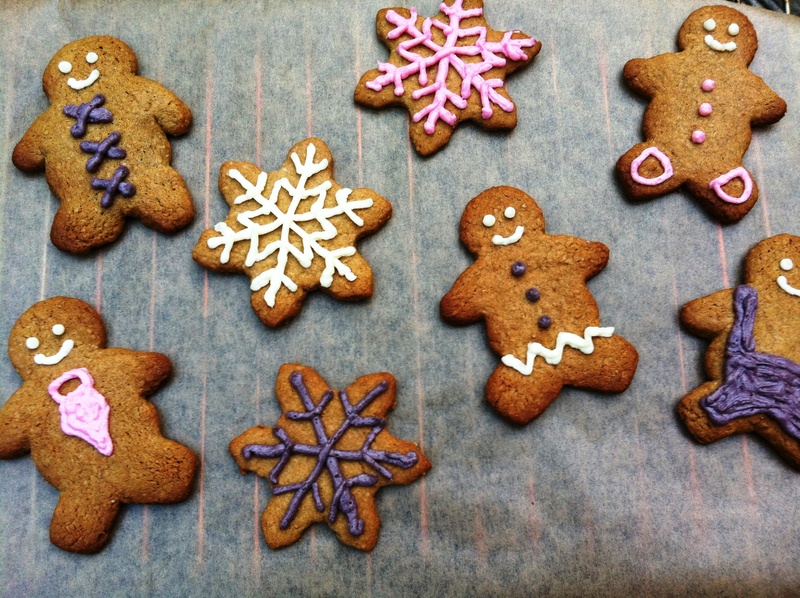 I am in love with the snowflakes and the gingerbread men with their little overalls. These look pretty freakin’ awesome! So cute and creative and no doubt delicious. i love what you say about white chocolate. true, it really cannot be counted as “real” chocolate, but given the quality, it can be a great addition to all kinds of recipes. and of course, i adore your gingerbread ice cream sandwiches, littleloaf! Claire – getting the ice cream in between the biscuits without melting it everywhere is a pretty tricky process! Jennifer – thank you! I think white chocolate in certain dishes is absolutely delicious – you just have to not compare it to dark chocolate. 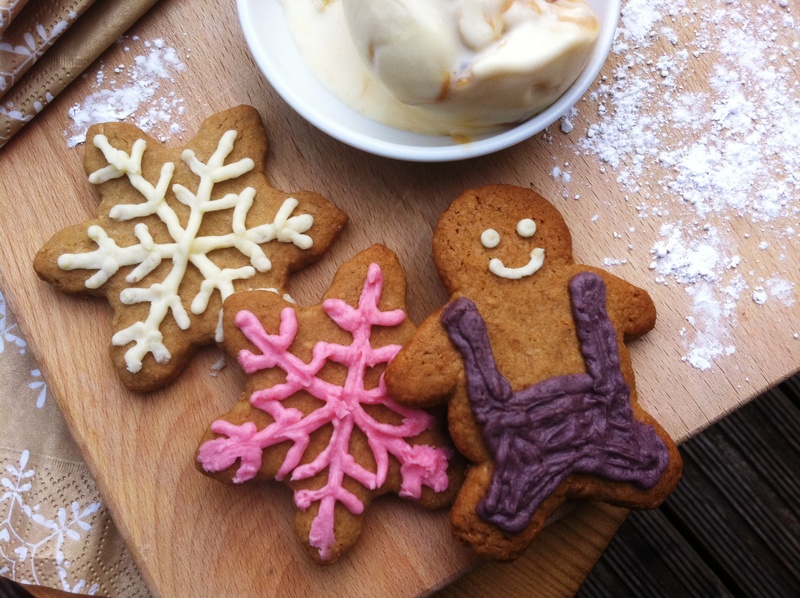 These gingerbread men are so sweet and I especially like the one in dungarees. I keep hearing about ice-cream sandwiches, but as I can’t have ice-cream touch my teeth, can’t quite get my head around them. But if I was going to try one, I think yours would be the one to pick. The Food Programme today featured an ice-cream maker whose ices, they reckoned were the closest to Italian gelato that were made in the UK. They certainly sounded really good. Apologies for not commenting much (at all) recently, I am getting really behind with all things blogging – especially writing up posts! Do try the double chocolate mince pies – it would be fun to have some white pastry ones and some chocolate pastry for contrast! That’s what I’m thinking at the moment, but don’t know if I’ll get around to it. If you don’t like ice cream touching your teeth then ice cream sandwiches are perfect – you just bite the cookie and the ice cream melts into your mouthful! Looks awesome! I love cookies and these look so good.